Current world number one Kento Momota of Japan exacted sweet revenge for his Asian Games defeat when he packed off defending champion Anthony Ginting in the quarter-finals in the USD350,000 Daihatsu Indonesia Masters in Jakarta on Friday. 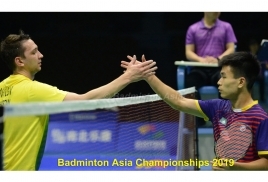 The 24-year-old Momota tamed the seventh ranked Ginting 21-9, 21-10 to reach the men's singles semi-finals. Indonesia, however, kept their men's singles hopes alive when Asian Games champion Jonatan Christie staved off a determined fight from India's No 8 seed K. Srikanth to prevail 21-18, 21-19. Indonesia also showed their strength in the men's doubles with two of their pairs making the last four. Defending champions and current world number one Marcus Fernaldi Gideon-Kevin Sanjaya Sukamuljo, however, were given a run for their money by compatriots Fajar Alfian-Muhammad Rian Ardianto before coming off 18-21, 21-17, 21-19 winners in 56 minutes. Former world champions Mohammad Ahsan-Hendra Setiawan demolished Chinese No 2 seeds Li Junhui-Liu Yuchen 21-16, 21-12 in quick 28 minutes to make the last four. The mixed doubles is closely followed by the homes fans who have been flocking to the Istora Senayan Stadium with special prayers for Liliyana Natsir who is playing her last international tournament before hanging up her racket after more than two decades of competitive badminton. She and Tontowi Ahmad wrote badminton history when the duo won the Rio Olympics gold in the mixed doubles - the first Indonesian pair to win the Olympic event. Seeded fourth in the Indonesia Masters, Tontowi-Liliyana marched into the last four with a 21-14, 21-16 win over Japan's Takuro Hoki-Wakana Nagahara to stay on course for memorable farewell present for the 33 year-old Liliyana. Indonesia also have hopes in the women's doubles when fourth seeds Greysia Polii-Apriyani Rahayu came through an 80-minute battle against No 8 seeds Jongkolphan Kititharakul-Rawinda Prajongjai to prevail 21-16, 17-21, 21-13 for a place in the semi-finals.